Researchers at MIT and Harvard have discovered a way of rendering excitons immune to getting stuck in minuscule defects as they hop through a material, which could possibly lead to improving efficiency in photovoltaic devices. A major limitation in the performance of solar cells happens within the photovoltaic material itself: When photons strike the molecules of a solar cell, they transfer their energy, producing quasi-particles called excitons — an energized state of molecules. That energized state can hop from one molecule to the next until it’s transferred to electrons in a wire, which can light up a bulb or turn a motor. 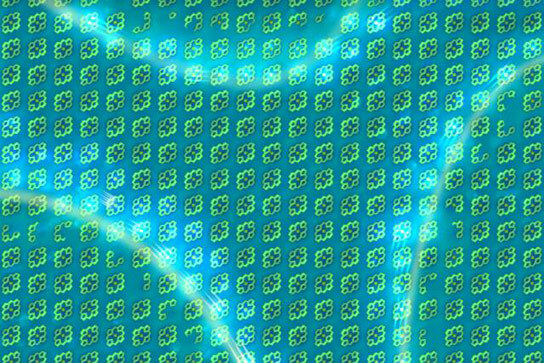 But as the excitons hop through the material, they are prone to getting stuck in minuscule defects, or traps — causing them to release their energy as wasted light. Now a team of researchers at MIT and Harvard University has found a way of rendering excitons immune to these traps, possibly improving photovoltaic devices’ efficiency. The work is described in a paper in the journal Nature Materials. Their approach is based on recent research on exotic electronic states known as topological insulators, in which the bulk of a material is an electrical insulator — that is, it does not allow electrons to move freely — while its surface is a good conductor. The MIT-Harvard team used this underlying principle, called topological protection, but applied it to excitons instead of electrons, explains lead author Joel Yuen, a postdoc in MIT’s Center for Excitonics, part of the Research Laboratory of Electronics. Topological protection, he says, “has been a very popular idea in the physics and materials communities in the last few years,” and has been successfully applied to both electronic and photonic materials. Topological excitons would move only at the surface of a material, Yuen explains, with the direction of their motion determined by the direction of an applied magnetic field. In that respect, their behavior is similar to that of topological electrons or photons. In its theoretical analysis, the team studied the behavior of excitons in an organic material, a porphyrin thin film, and determined that their motion through the material would be immune to the kind of defects that tend to trap excitons in conventional solar cells. The choice of porphyrin for this analysis was based on the fact that it is a well-known and widely studied family of materials, says co-author Semion Saikin, a postdoc at Harvard and an affiliate of the Center for Excitonics. The next step, he says, will be to extend the analysis to other kinds of materials. While the work so far has been theoretical, experimentalists are eager to pursue the concept. Ultimately, this approach could lead to novel circuits that are similar to electronic devices but based on controlling the flow of excitons rather that electrons, Yuen says. “If there are ever excitonic circuits,” he says, “this could be the mechanism” that governs their functioning. But the likely first application of the work would be in creating solar cells that are less vulnerable to the trapping of excitons. The work received support from the U.S. Department of Energy and the Defense Threat Reduction Agency. Norman Yao, a graduate student at Harvard, was also a co-author. 2 Comments on "Theorists Find a New Way to Improve Solar Cell Efficiency"